Being a popular entity, we are providing an inclusive series of Panasonic MIG Welding Machine. Aimed at prosper growth in our domain, we are instrumental in offering an excellent quality MIG Welding Machine. 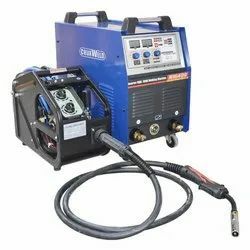 The MIG welding machines supplied by us are known for their durability and performance. These machines welding mig wire that are of ESAB make, Advani Make and L & T Make. Our innovative sorts of MIG welding machines are popular for high quality, longevity, optimum durability and performance. The wires used in these machines are of superior quality and of ESAB make, Advani Make and L & T Make. Welds 24-gauge to 3/8 in. material in a single pass. Uses 120V or 240V power.